It may be together, but you still have to protect it. For dramatic results, it's hard to beat the finishing process. With the first touch of a rag or brush, your furniture piece comes alive and the true character of its wood grain jumps out at you. Gone is the well-sanded but relatively neutral surface of the raw stock. And if you have any doubts about ether all the work was worth it, those will probably disappear, too. The first step in the process is to pick a suitable finish. Many products are available with varying characteristics. But the one thing they all have in common is protection. All are designed to inhibit the transfer of moisture and to prevent the surface from being contaminated by dirt and stains. 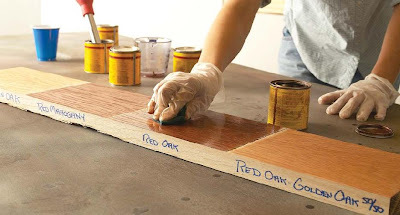 The most common finishes are shellac, lacquer, varnish and oil. All are solvent- or oil-based products and therefore require some precautions. Wear protective gloves, goggles and a respirator with organic vapor cartridges when using these materials. And make sure your work area is ventilated according to the recommendations printed on the product's container. One of the biggest differences among these four traditional finishes is how they function on wood. Shellac, lacquer and varnish are all surface finishes. This means that they do not penetrate, to any great extent, past the surface of the wood. The first coat certainly goes in the farthest, but subsequent coats merely build on the first to form a smooth, usually glossy, surface. Oil, on the other hand, is considered a penetrating finish because it reaches much deeper into the wood and leaves only a microscopic layer of finish on the surface. Subsequent coats continue to penetrate. All these finishes have their strengths and weaknesses. Shellac, for instance, is a wonderful product. When properly applied it creates a stunning high-gloss surface which over time takes on a remarkable amber color. It's also very fastdrying, which is a great advantage over some other finishes. Unfortunately, shellac is very prone to water stains. Lacquer is also quick-drying and is the preferred finish of many professionals. It's usually sprayed on and yields a clear, hard finish that stands up well to practically any abuse. It is, however, very flammable. Varnishes, both the traditional types and the newer polyurethane versions, are extremely durable and some impart a warm amber tone, not unlike shellac. Unfortunately, varnish can be difficult to apply and it takes a very long time to dry. Because of this, airborne shop dust becomes a real problem. It settles in the finish before the finish is dry. Then it has to be rubbed out before another coat is applied. For the beginner, an oil finish is the best choice. It's easy to apply, dries fairly quickly and is not difficult to repair. It also imparts silkiness to the surface and develops a beautiful patina over time. Always dust off the piece thoroughly before moving to each new grit and ease any sharp edges by hand sanding. Once you're done sanding be sure to wipe off the entire piece with a tack cloth or a rag that's been slightly dampened with linseed oil. If you want to alter the natural color of a piece, you must stain or dye the wood. Oil-based stains are certainly the most common approach. These products are available at paint and hardware stores, and at home centers. They contain a pigment that is suspended in an oil and mineral spirits solution. Oil stains don't penetrate the wood deeply. They give color by embedding opaque pigment in the surface grain. You apply these stains with a rag or brush, let them sit for 10 to 15 minutes, and then wipe them off. Aniline dyes are another approach to coloring wood. The type that is dissolved in water is the safest and easiest to use, as well as being the most colorfast. These dyes penetrate much more deeply than stains and actually change the color of the wood. It's easy to intermix colors and you can change the concentration of color simply by adding more water. Once you've chosen your coloring method, be sure to test it out on some scrap pieces of stock before turning to your project. Taking the time to get it right is much easier than removing a stain or dye that you don't like. When you're ready to apply your oil finish, be sure to read the manufacturer's instructions carefully, and do what's recommended. While specific directions may vary, there are some general guidelines for applying an oil finish. Begin by rubbing a liberal amount of oil into the surface of the wood using a lint-free rag. Allow the oil to absorb for about an hour, then wipe off the excess. Let the surface dry for 24 hours, and then rub the whole piece with No. 0000 steel wool. Remove any dust, then apply another coat of oil as before. For a good finish, you should apply a minimum of three coats. Once the last coat is dry and rubbed with steel wool, apply a light coat of paste wax to the entire surface. When the wax takes on a dull appearance, buff the surface to a satin sheen with a clean, dry cloth. Woods are playing a vital role in our house as well as flooring accessories. Most probably, it gives a perfect finishing touch to our furniture and flooring. But apart from these, we should also take good care while dealing with wood's characteristics and features. Doesn't matter whether we use woods for furniture of flooring, we should follow some beneficial steps to keep it finishing and in good condition.